James Bullock et al. 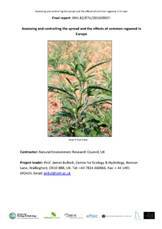 Assessing and controlling the spread and the effects of common ragweed in Europe. Final report: ENV.B2/ETU/2010/0037. pp. 456. The common ragweed is a native to North Ameirca rapidily spreading across Europe, where the economic costs associated to its harmful impact on human health and agriculture are estimated to be around 4.5 billions of euro per year. This is one of the main results of the report. The study, carried out by an international team of experts led by the Natural Environment Research Council (UK), provides synthetic and systematic review of all available information on the current extent of ragweed infestation in Europe, including an economic, social and environmental quantification of direct and indirect harmful effects in all sectors, as well as an assessment of measures to control ragweed spread and introduction (now and in future climates).